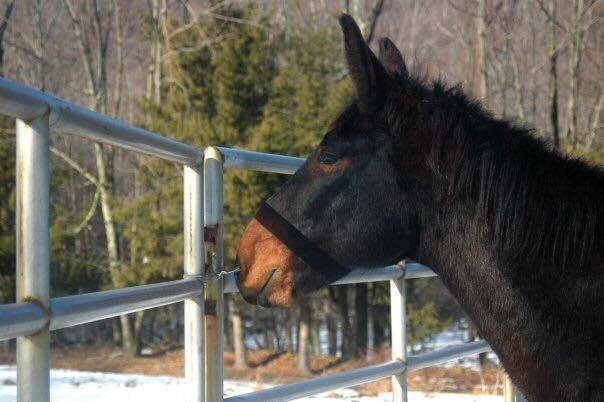 When I first stumbled, partially-educated, into owning Marty, I sent out a plea for help on a horse forum I was part of: was there anyone out there who knew anything about mules? 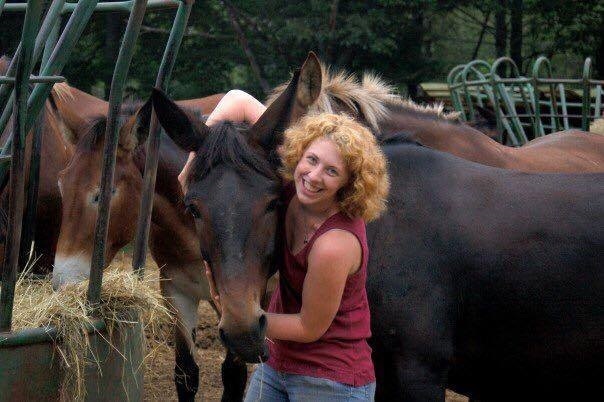 One of the people who responded was Megan, who had worked with mules on a dude ranch in Pennsylvania, USA. She’s been an invaluable source of help and advice ever since, and although she doesn’t currently own a long-ears I thought she would be an ideal candidate to feature on Mule Tales. I was correct – this is a thoroughly brilliant read! All images in this article are © copyright Megan Beyer. 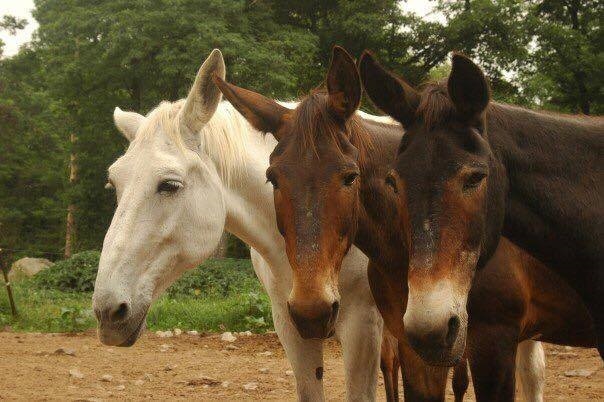 Three of the ranch mules: Sarge, Flicka and Mack. 1. Please give us a typical day-in-the-life from when you worked at the ranch. Typical day at the ranch started early. I’m the type of person who gets places early, so my day always started a bit before the other employees. I’d get there while the property was shrouded in mist (there was always mist…) and eat my breakfast in the yard. Once my co-workers arrived we’d gather up halters and ropes and start the process of bringing in all 57 mules and the one horse – and tying them at ‘their’ feeder and passing out breakfast portions. While they were eating we’d groom, do feet, and distribute tack. Each mule got two days a week off – so those who were not working that day or the few that were retired got put back out in the field once they were done eating. Except Old Man Jaime who would jump out of the pasture if he was left there and pester us, so we let him hang out in the yard loose most days. He was semi-retired but still wanted a job so he became our greeter. We’d then divvy up work for the day. Some people would take guests out on trails, some of us would clear paths, work on the dam (which was forever in need of repair), muck, break one of our two new mules, or mow the lawn. Whatever needed doing. For the most part I took guests out, and helped with the medical stuff for the mules. Of the employees I was one with the most riding experience – so I did the bulk of the riding with two other women. We’d take groups of guests on rides ranging from an hour to four through the mountains, getting them on at the yard and off halfway through for a walk break. We gave riding instruction and tried to keep the guests safe, but really the mules were my first priority. Guest’s experience ranged from Never-Touched-An-Equine to good riders, and we tried to tailor the rides to that experience. Sometimes when we’d have good riders in a group of green ones I’d split the good riders off and we’d go jump gorges or picnic tables – go straight up the steepest hill (but Zorro’s favorite was going back down that same hill). We rode from morning till night, often having to switch on head lamps to get home. The mules that got ridden by the guests normally went on two shorter rides a day – or one long one. The wrangler’s mules worked all day – and loved it. They were athletes. Once we were done for the day we’d strip off tack, feed dinner, and turn the herd out for the night. 2. Tell us about your mule – what made him special? Zorro was a special guy who didn’t suffer fools. He’d been roughed up a few times before I met him and was pretty suspicious of people. Of course – his suspicion came with a healthy dose of Mule Justice in the form of flying back feet. My first day they told me to stay away from him – because he’d put you in the hospital. He was 15.3, stocky. Probably a Percheron or a very thick made QH mule. He had the most beautiful face and neck of any mule – but then again I’m biased. And boy was he a handful. The first day I worked with him he did try to kick my head off my shoulders. It didn’t seem to be pure fear – more that he’d learned that if he kicked, people left him alone. I held out a sturdy stick in front of me, pointed at his hip and let him kick until he was done. When he figured out it wasn’t getting him anywhere he stopped, turned, and looked at me as if to say “OK, you’ve bested me this time. I’ll get you soon” But when I slipped him a sugar cube and brushed him off his eye melted a bit and he decided it wasn’t so bad to have a human friend. That’s not to say that ALL humans were friends – far from it. Myself and one other girl were the only ones allowed to handle him. We were the only ones admitted into his circle of trust. Most of the other mules on property were the friendly kind – they’d butter up to anyone who might have a sugar cube for them. Not Zorro – he had strong opinions. He was a hard worker, though. He loved having a job. It was always funny to watch a mule that was either a Customer Mule turned Wrangler mule, or one like Z who went from not having a job to being a Wrangler Mule. They were normally the younger, fitter mules to begin with – but not always at the top of the social structure in the herd. Once they became a Wrangler mule and rode at the front or the side of the trail ride they developed this swagger. And inevitably they’d rise to the top of the hierarchy within the herd. Zorro became one of the best workers on the entire property. He didn’t know how to quit. And he was dedicated to me, entirely. He was the first one at the gate in the morning and hell had no fury like a mule scorned if I haltered any mule before him. He was smart – one day we were scouting a new path and suddenly he stopped and refused to walk on. I looked down and saw hidden in the grass barbed wire wrapped around his front legs. I got down, cut him out, discarded it far off the trail, mounted up and we continued on. He also alerted me both times we came across bear on the trail. He’d stop with his head up and point out the bear with his entire being. He never once spooked in such a situation. Zorro making his opinion clear when Megan spoke to another mule. 3. What did you learn about mules, and what advice would you give others? They are less forgiving than a horse. A horse can be forced into something against its better judgement. A mule never will. And they remember if you try. If you’re asking for something that your mule thinks is wrong – but absolutely has to happen – try asking a different way. These animals will give you their hearts and will be a great partner for you – but you have to prove yourself worthy first. I saw a mule who had a fairly deep laceration let her handler doctor the wound before the vet got there, entirely loose in a field. She was clearly in pain but trusted her rider to make it better. A horse would have run off or kicked the person for the pain they were causing. The mule stood and waited. Once a mule has decided to trust you, they’ll let your will over-ride their mule sense, to a point. They’re much more thinky than a horse. As far as basics, pick the front feet up with your head towards their head. Mules are much more flexible than horses and I’ve seen one kick (the farrier) with their back foot when he was standing in front of their shoulder. Don’t feed them as much as a horse, and not as rich of food. Get a farrier who knows what they’re doing with mule feet. 4. 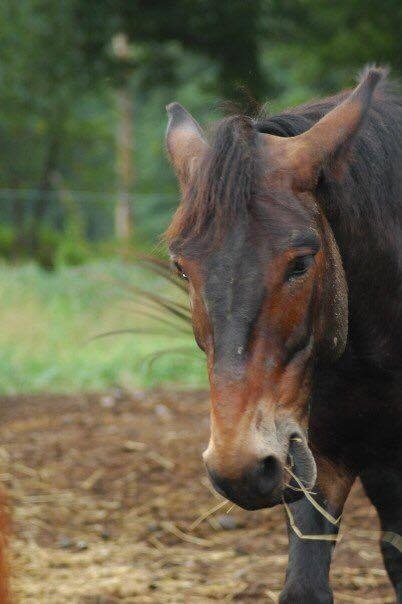 Do you have a story to share that you feel sums up your mule’s personality? The personality traits I associate with Zorro most are loyalty and bravery. After a while he and I became one creature in two bodies. There were several times he put himself in danger to keep me out of it. The time that stands out most in my mind was when my fellow guide and I got ourselves stuck up on a high mountain trail, with a sharp cliff to the right and a steep hill to the left, with 12 city folk on our ride. A storm the night before had knocked down a tree across the path and there was no safe way to turn around and go back. There was not enough space to dismount, this was essentially a goat path. The tree was too high to jump. My fellow guide was on a huge (19hh+!) mule, so there was no way she was getting under the tree. But I figured I might fit, and I knew if I could get under I’d be able to get to a turn around just a few hundred feet past the tree. My plan was to get to the turn around, tie Z and come back and clear the tree by hand. 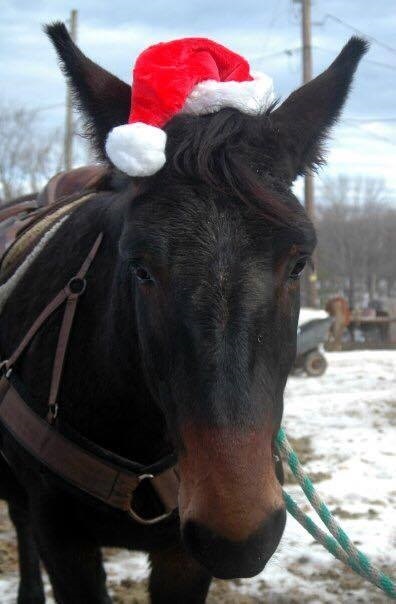 I slung low in the saddle and asked Zorro to slowly head under the tree. All was going well until my jeans got snagged on a branch. Zorro stopped and waited, half under the tree, with me stuck. He was being so good, so patient as I wiggled my way free. Unfortunately, the tree was old and rotten and my wiggling to get free was the last straw for the trunk. It broke and came crashing down. Zorro got himself free and bolted, but I was still stuck so I came off, and the tree came down on top of me. I was unconscious at that point, having landed on my head (boy, that explains a few things…) but I’m told by my other wrangler friend that she was frantic, trying to get to me, but the remains of the tree were blocking her – remember, she couldn’t dismount. She was sure I was going to bleed out there on the ground. But just a minute later here comes Zorro, he’d gone up to the turn around and come back. He dragged me free of the tree and all the way to the turn around point (and that sent the tree down the slope enough that the others could get through). There he stood guard literally over me one foot over each limb. I came back to consciousness with big brown eyes looking down at me and a soft muzzle lipping my face. Once I was awake he allowed my wrangler friend to come take care of me, but not before. I had a concussion and a HUGE bruise on my back and thighs from where the tree fell on me, but all in all it could have been a lot worse. I got out of there with only a few scrapes and no broken bones. If that tree had pulled me down the cliff I probably wouldn’t be here today. It broke my heart – that when I left to go back to college they wouldn’t sell him to me. He’d gone from being the ‘dangerous’ ride to being one of the most coveted on property. He still made you prove yourself before he’d accept you, but he was a good boy and a great partner. I miss him. 5. As someone who now owns horses, but appreciates mules: what would you say is the biggest difference between them, and in what circumstances would you prefer one over the other? The biggest difference, to me, is the brain. You can see the gears in a mule’s head turning as they try and figure out a new situation. And once they’ve figured it out – hope really hard that they figured out a solution you can work with. Because if they turn their brain to evil purposes, watch out. It can be hard to convince them to go back to their previous behaviors. If I was ever going to have a working ranch job again I’d find a mule. They’re so much sounder of body and mind than horses. If I was going to be doing a lot of hard riding, mountain riding, or back country riding I’d find a mule. My horses live the life of luxury. Obviously the yearling doesn’t do much of anything besides eat and poop at the moment, but neither of them do much more than an hour a day of work. Mules seem to thrive in a rigorous work schedule. They love adventure, and doing new things. I’d never trust a horse on the kinds of trails we were riding on the ranch. It was so steep, the footing too technical. I never worried about Zorro in those conditions. I let him pick his way down the path as he wanted. He knew the best way to keep himself safe and sound. I’d love to have a mule again, but I want a special kind of mule. I want a cross country mule! I want a big, well balanced, athletic mule who can compete against horses and win in English disciplines. Most of the mules in my area are small, or very stock-horse type. My goal is to raise my (Shire x Hanoverian) filly, compete, then find her a nice donkey boyfriend to cook a mule for me. I miss watching long ears flop with every step down the trail. Wow! I really need to get to dude ranch to learn more about mules! Thanks, this has been one of the best mule tales so far! Keep em’ coming!